Which of the three big environmental, social and corporate governance reporting frameworks reference the topics your company cares about? This is part 2 of 2. Read part 1 here, where we present the first part of our comparative analysis of the three dominant EESG reporting frameworks: the Global Reporting Initiative (GRI), the Sustainability Accounting Standards Board guidelines (SASB) and the International Integrated Reporting Council (IR) Framework. We analyzed our database of 40,000-plus reports from over 6,100 organizations to pinpoint references to the frameworks in both Annual Financial reports and Sustainability reports. Don’t worry, we didn’t do this by hand. We had the help of "robots," or what we like to call "automated human expertise." Our results demonstrated that while GRI remains the most widely adopted framework, SASB and IR are stepping it up. Given that South Africa’s King Report on Corporate Governance (King III) (PDF) supports the use of IR in the region and that SASB has strong roots in the United States and uses a definition of materiality that resonates with investors, this is not surprising. Part 2 provides insights into not only where reporting frameworks are being referenced but also which EESG topics are being referenced in report types (sustainability or annual reports). We will examine individual EESG topics, perform an innovative EESG topic migration analysis and examine the gaps between annual financial reports and sustainability reports. The increasing complexity of voluntary and mandatory disclosure requirements is providing companies with a number of reporting channels (annual financial reports, sustainability reports, strategy reports, etc.). An in-depth look at the EESG frameworks and topics emphasized by companies in reporting documents is key to understanding future trends and pre-empting changes in this ever-changing and competitive arena. 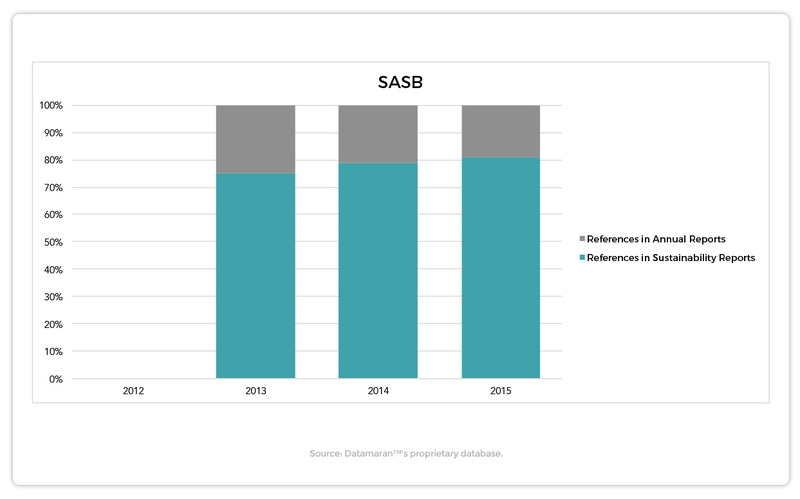 Starting in 2013 (the first reporting year in which the SASB framework was operational) references to the framework had the largest share in sustainability reports, suggesting that reporters are eager to use this format to talk about SASB. More interesting is the comparison between the references to GRI and IR. 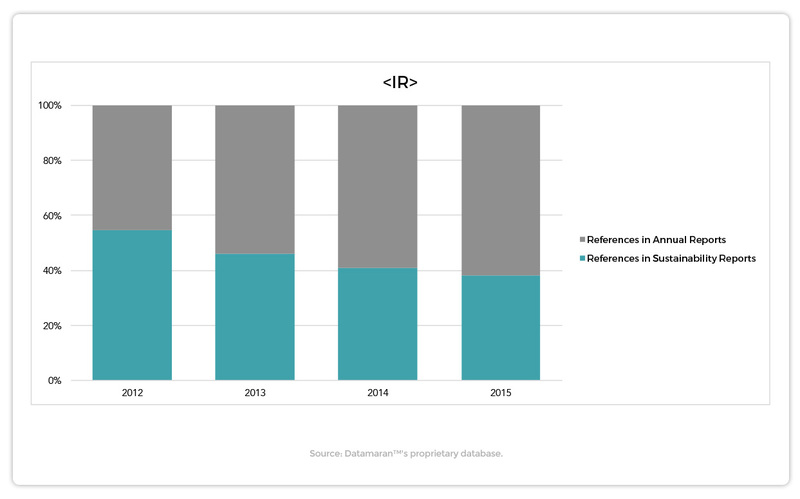 The analysis suggests that while GRI is widely referenced in sustainability reports, references to IR are increasingly migrating to annual financial reports. This suggests that the "integrated philosophy" behind IR is gaining traction and that the two frameworks might further distance and differentiate themselves from one another. Datamaran also facilitates analysis at a more granular level; processing and annotating specific EESG topics addressed in annual financial reports and sustainability reports. These "highlighted sections" allow us to monitor which reporting format companies use to disclose these topics and to check, for example, how topics migrate from annual financial reports to sustainability reports, and vice versa. We analyzed EESG topic disclosure trends from 2010 to 2015 for the largest 500 companies in our database publishing both annual financial reports and sustainability reports. This graph tracks the Top 6 "migrating" topics. In other words, topics which show a decline in emphasis in one report type (financial reports) and an increase in the other (sustainability reports). The growth/decline in the emphasis of a topic is calculated on the basis of the discussion around the topic from 2010 to 2015. Results show that while emphasis of both employee satisfaction and climate finance has declined in sustainability reports, it has increased in annual financial reports. This is not surprising as these topics are recognized as having immediate financial impact. More specifically, employee satisfaction has consequences for talent attraction and retention, while climate finance aims to minimize the financial risk associated with climate change. The latter is especially relevant given the recent establishment of Michael Bloomberg’s Global Taskforce on Climate Change. References to transport related topics such as eco-efficient employee mobility, eco-efficient transportation and employee mobility are moving from annual financial reports to sustainability reports. The same can be said for the topic of forests. One possible explanation for this migration is that because these topics are perceived as more sustainability-specific, reporters prefer a more dedicated channel for disclosing information related to them. The results show that information security and anti-corruption and bribery have experienced a sharp increase in emphasis in annual financial reports. Financial inclusion, reputation, IP infringement and board composition follow, growing in emphasis at a faster pace in annual financial reports than in sustainability reports.